I’m Pascal Grandjean. Born in 1968. Licensing since 1986 as FC1LEN. Two years later, and after a CW test I was FD1LEN. 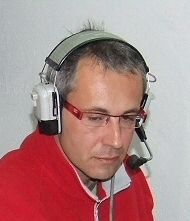 My instructor at the local radioclub was Georges Guinard F6DDU (sk). I’m married and have two childrens: Louis, was born in 1996 and Alice in 1999. My wife Marielle is pharmacist. I’m working as Unix administrator/IT. We are living in Messein a small village located in the NE part of France. 15Km south from Nancy. Very classical setup on HF: IC-746, 800W amp with 2 elements 5 bands quad or GP for lower bands. On VHF and up, I’m qrv from 2 m up to 3 cm but my activity are mostly on portable operations. See jn38.org for my V/U/SHF contests activity. At home I use TS790 with 4cx250 amp iin a 9 el on 2m. On 3 cm I use IC275A as FI , DB6NT tvt, PA 30W and 85 offset dish.